Given the importance that we each attach to our food choices, wouldn’t it be wonderful if there was a single dietary approach that would allow us to enjoy a wide variety of delicious meals and digest them comfortably, while also reducing our risk of developing serious gastrointestinal disorders and maximising our chances of living a full and healthy life? In recent years medical research has provided us with strong evidence from multiple studies that eating a diet which includes lots of fresh fruits and vegetables, whole grains, beans and pulses (peas, split peas and lentils) while avoiding saturated fats (predominantly animal fats) and processed meat can achieve all of the above. Public Health England’s “Eatwell Guide” is an incredibly useful place to start if you wish to improve your diet. When this evidence-based guide to healthy eating was published in 2016, it was estimated that if every adult in the UK followed its recommendations, seventeen thousand new cases of colorectal cancer and 4,300 new cases of stomach cancer would be prevented every year. This was in addition to an estimated 26,000 fewer cases of coronary heart disease and 4,000 fewer cases of breast cancer in the UK per year. These impressive statistics demonstrate the power of a healthy diet. As you will see below, in order to maximise our chances of a long and healthy life, we should eat a plant-based diet that derives its calories and nutrients from a variety of fruits, vegetables, wholegrains, beans, nuts and pulses. The Eatwell guide recommends that fresh fruits and vegetables should form more than one third of our daily diet. To achieve this it advises that we should enjoy a variety of fresh produce and eat at least five servings a day. However, a subsequent study from Imperial College London demonstrated that in order to further reduce our risk of serious diseases and premature mortality, when it comes to fresh fruits and vegetables we should actually aim for ten servings a day. If you are struggling to introduce extra fruit and vegetables, please have a look at my "Simple Green Smoothie recipe below. Whole grains provide us with dietary fibre (also known as “roughage”), which is essential to maintaining healthy digestion. Chose whole grain breads, wholewheat pasta and brown rice. 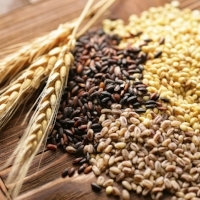 These foods are rich in whole grains and should make up one third of the food we eat. Eating plenty of dietary fibre keeps our digestive processes ticking over and promotes the growth of beneficial bacteria in our bowels. However the benefits extend much further than this, by increasing our intake of dietary fibre we also reduce our risk of developing serious diseases including stomach cancer, colorectal cancer, type 2 diabetes, heart attack, angina and stroke. Like many gastroenterologists, I often recommend that my patients reduce their intake of dairy products, particularly milk and cheese. 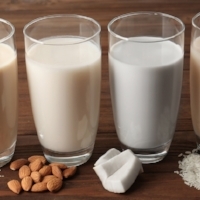 There are several good reasons for this, as eliminating dairy foods can help to alleviate the symptoms of numerous conditions including lactose intolerance, irritable bowel syndrome, Crohn's disease and Ulcerative Colitis. Click here to learn why you should consider going dairy-free. Optimal health requires that healthy adults should consume enough protein to provide about 8-9% of our total calories (45 to 55g of protein per day). The Eatwell Guide reminds us that there are many ways to meet this daily protein requirement. We should ensure that our diet includes healthy sources of plant-based protein such as beans, peas and lentils. These foods are rich sources of healthy protein and also contribute to our daily vegetable intake. Multiple studies have shown that opting for plant-based sources of protein is better for our gut health, overall wellness and longevity. A healthy diet should also include sources of healthy oils called omega-3 fatty acids. These beneficial fatty acids can also be boosted by including brussel sprouts, flaxseeds, walnuts or chia seeds in our diet, or by taking an omega-3 supplement. Omega-3’s are also found in oily fish. We can keep our consumption of harmful saturated fats low by reducing our intake of meat and by eliminating processed meats (bacon, sausages, ham and luncheon meats) and red meats (beef, lamb and pork) from our diet altogether. Not only do red and processed meats increase the levels of harmful LDL cholesterol in our blood, they also significantly increase our risk of developing colorectal cancer. Many people struggle with increasing their intake of fresh fruits and vegetables, and may be unfamiliar with interesting ways to add beans and pulses to their diet. My advice is to learn some great vegetable-based recipes. There are plenty of great books and websites out there; I can recommend “The World of The Happy Pear”, River Cottage's "Much More Veg" and any of the “Deliciously Ella” series. Start by exploring the wide selection of recipes available for free on-line. These recipes will introduce you to simple ways to make your fruits, vegetables, beans and pulses taste great with or without lean poultry or fish served on the side. You can also learn new easy ways to serve up old favourites while minimising your use of unhealthy fats and avoiding harmful processed meats. And finally, if you choose to make healthy changes in your diet, make them gradually. Start by changing your breakfast to a healthy bowl of porridge with added fruits and nuts or a large fruit salad and whole grain toast. After a week or so move onto your other meals and finally, eliminate the unhealthy snacks. Making these changes over a period of a few weeks will give you and your digestive system time to adjust to your new healthy dietary pattern. "By eating a healthy diet, you will keep your digestive system ticking over, promote the growth of beneficial bacteria in your gut and reduce your risk of developing serious gastrointestinal disorders in the future."